Boat ramp is located on US 69 1.5 miles south of Mineola on US 69. The site is located on the west side of the road and the north side of the Sabine River. Boat ramp is located on FM 1804 (also known as Hoard Road) south of Highway 80, on the west side of the road and the north side of the Sabine River. 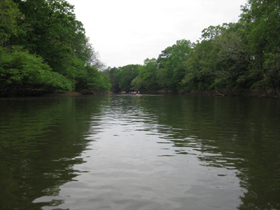 Alternate Access Site: An excellent camp area is located on the Mineola Nature Preserve 5 miles downriver from the put-in boat ramp. 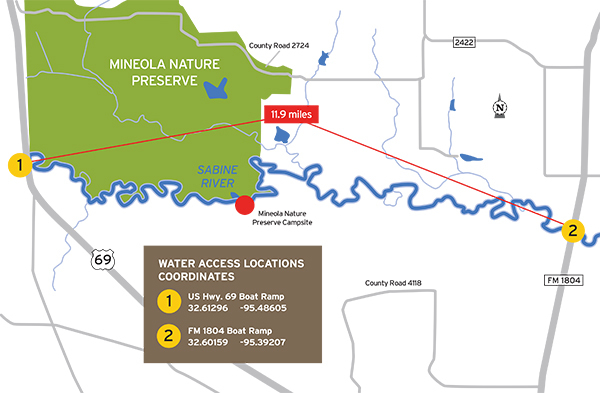 You may reach this site by water or by hiking or biking inside the Mineola Nature Preserve which is open 7 days a week from 8:00a.m to sunset (903-569-6183; www.mineolanaturepreserve.com). CAUTION: Check river gage depth prior to river use. River use is not recommended for boating when the river depth gage height is below 2 feet. This is a beautiful, quiet stretch of river. However, flows in the Sabine River along this stretch can be limited as they are dependent on how much water is being let out of the upstream lakes. While there no man-made obstructions on this reach, there are numerous snags and woody debris to navigate around, particularly when water levels are low. Additionally, when heavy rains occur, high waters can create dangerous conditions. The Sabine River is a natural river that is unrestrained by flood control dams or other manmade structures. As such, the Sabine River is readily influenced by rainfall runoff that may create temporary high flows and undesirable water quality conditions. Five river miles into the paddling trail there is a public camp at the intersection of the river and the abandoned railroad trail that runs through the Mineola Nature Preserve. That trail extends all the way from the river to Cap Ranch Road. It is a nice camp for river runners who want to spend the night or just rest on their trip. The camp has six tables, a fire ring/grill, and gravel tent and sleeping bag sites available. There are three large trees across the river that have not been removed. Due to their angle across the river, when the river is low you can go under the tree trunk, and when the river is high you can go around the low end. These can be a problem for large boats unless the river is at least 5 feet at the gage. There are minor log and brush jams as well, however anyone with a canoe can make the trip when the river gage at Hwy. 69 reads at least 2 feet. 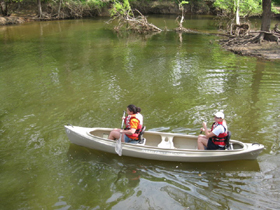 Flow and water quality information is available to paddlers on the web (under Texas and Sabine River near Mineola). River use is not recommended for boating when the river depth gage is below 2 feet. This section of the river supports numerous catfish, buffalo, gar, and sunfish. Small lures such as jigs, plastic worms, spinner baits and light-line are recommended. Minnows, worms, and catfish baits are recommended. The riparian corridor of the Sabine River supports a great diversity of plant and animal life along the river and beyond the banks. Birds spotted here include Wood Ducks, owls, bluebirds, blackbirds, cardinals, chickadees, crows, doves, egrets, flickers, finches, flycatchers, hawks, herons, hummingbirds, jays, kingfishers, meadowlarks, mockingbirds, orioles, Osprey, swallows, swifts, thrashers, titmouse, flycatchers, and woodpeckers to name a few. Numerous large and small trees grow along the river. Common wildlife encountered include deer, raccoons, coyote, wild hogs, snakes, and squirrel. 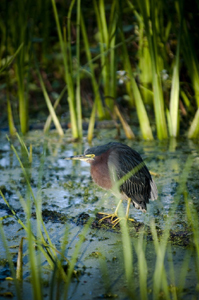 With approximately 3,000 acres, this preserve is the "Birding Capital of East Texas and offers equestrian, biking, and hiking trails as well as several fishing ponds to enjoy. Primitive and RV camping available, including the campsites 5 miles downriver from the put-in for the paddling trail which offers pier, tables, fire ring/cooking grill, and gravel tent sites. The city of Mineola improved the abandoned rail-road track trail allowing hikers to reach the river and camp sites. Contact City Hall at 903-569-6183; www.mineolanaturepreserve.com. Located downtown on Front Street. Located just 5.2 miles outside of Mineola with primitive camping areas, fishing, recreational boating, and a beach area for swimming. 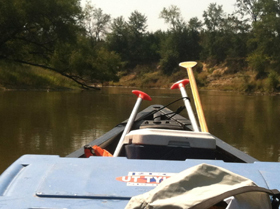 located 15 miles from Mineola; RV camping area as well as fishing and boating. “Bass Fishing Capitol of East Texas” is only 18 miles from Mineola. This trail was made possible through a partnership between Texas Parks and Wildlife Department, Big Thicket National Preserve, Big Thicket Association, Beaumont Convention & Visitors Bureau, and Lower Neches Valley Authority.City of Mineola, Nestle Waters-OZarka, Inc, TransCanada Charitable Fund for East Texas Communities Foundation, East Texas Woods and Waters Foundation, Sabine-Neches RC&D Area, Inc., Texas Department of Transportation, The University of Texas At Tyler, Wood County, Reynolds and Kay, Ltd, Chauncey Deller, Jared Haney, Alan Haynes, and Brookshire In Memory of S.W. (Woody). 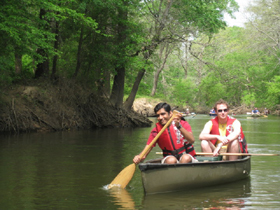 Local Canoe/Kayak Rental Service is pending: Contact Mercy Rushing with the City of Mineola for more information: 903-569-6184.